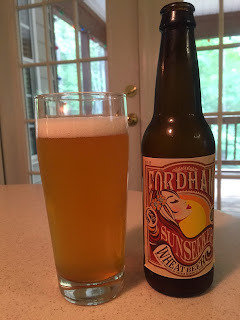 That previously mentioned package from Fordham & Dominion Brewing also contained a few bottles of Fordham Brewing's new Sunseeker Wheat. This German-style Hefeweizen is another year-round addition to the brewery's lineup. The unfiltered wheat ale pours a cloudy straw color and exhibits a short-lived white head. The aroma is sweet malt with hints of clove and banana. The flavor is similarly sweet with cloves, coriander, banana and lots of wheat flavor. There's an apple-like tartness in there as well. Copious carbonation tingles the tongue. The finish is moderately tart and a little drying. A low 5% ABV is in keeping with the classic "Summer Wheat" beer theme. Wheat beers may not be my favorite style, but I do enjoy a well-done Hefeweizen. Fordham Sunseeker is an impressive domestic German-style wheat beer. I always keep some Hefeweizens and Wits in the beer fridge since Colleen enjoys them very much. She wasn't home when I opened this one, but after I share the remaining review bottles with her, I wouldn't be surprised to see Sunseeker on the shelves downstairs soon.